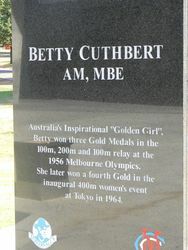 The statue commemorates Australian athlete, Betty Cuthbert (1938 - 2017). The Tattersall’s Parade of the Champions undertaking is a gift to the people of Australia by Tattersall's and is a focal point of the Yarra Park precinct. In 1956, at the Olympic Games in Melbourne, Betty Cuthbert became the first Australian athlete to win a gold medal on Australian soil. In fact, Cuthbert won gold in three track and field events at these Olympics: the 100 metres, 200 metres and the 4x100 metre relay. She made a winning return to form at the 1964 Tokyo Olympics, taking gold in the 400 metres. She has achieved 16 world records. In the 1970s, Cuthbert was diagnosed with multiple sclerosis and began actively campaigning for research funds for the Multiple Sclerosis Society. Betty Cuthbert is known as "The Golden Girl."